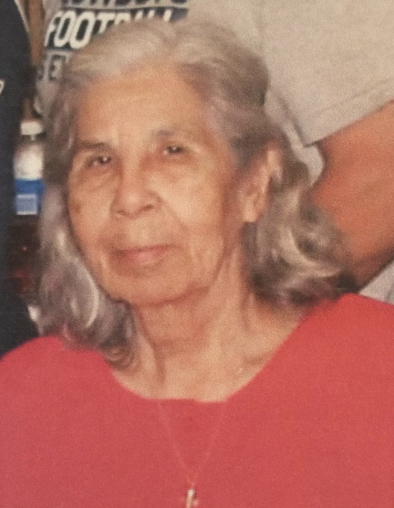 Burlington, Colorado resident Eugenia (Esquivel) Rodriguez, age 83, passed away Tuesday, November 27, 2018. Eugenia was born September 6, 1935 in Queen Creek, Arizona to Bernardino and Maria (Alvarado) Esquivel. She grew up in Mexico and moved to Texas in 1965. She moved to Goodland in 1970, back to Texas in 2005, and came back to Goodland in 2012. She moved to Burlington in 2015 where she currently resided. On August 30, 1954, Eugenia married Pedro Rodriguez in Cd. Acuña Coah, Mexico. Eugenia was a loving wife and mother. She enjoyed quilting and spending time with her family. She was a member of Our Lady of Perpetual Help Catholic Church of Goodland. Preceding her in death were her parents; her brother, Anatolio Esquivel; and her sister, Cresencia Dominguez. She is survived by her husband, Pedro; son Pedro Jr. (Gloria) Rodriguez of Garden City, KS; daughter, Eloise (Raul) Fuentes of Burlington, CO; son, Joe Rodriguez of Dodge City, KS; son, Tino (Jackie) Rodriguez of Castle Rock, CO; son, Roy Rodriguez of Texas; daughter Patricia Rodriguez of Goodland, KS; daughter, Mary (Hector) Burillo of Garden City, KS; 32 grandchildren; 46 plus great grandchildren; and 4 great great-grandchildren.